We are about 24-hours post non-waiver trade deadline and the talk around baseball is how the Texas Rangers got about five times better than they were before Monday. The Rangers were able to acquire slugger Carlos Beltran from the Yankees as well as highly sought after Jonatha n Lucroy from the Brewers, all while keeping their two top prospects. These two additions should make up for the lack of quality in the bullpen. Barring an implosion from the starting rotation, the Rangers are for the real deal this postseason. Another winner - in a sort of bizarre way - is the New York Yankees. They Yanks' finally came to their senses and became sellers for the first time in a long time. They were able to free up cap space by moving Aroldis Chapman, Andrew Miller and the aforementioned Beltran. The return from those trades was a handful of prospects that make the Yankees future look very bright. But enough about the news, let's make some money tonight. Thursday was frustrating to say the very least. I was on the right side of both games. Both Minnesota and Los Angeles Angels were able to win their games. However, out of their combined eight runs, seven of them came after the sixth inning, which means an "L" when it comes to my First 5 bets. That happens sometimes, and we can't control it. We must move forward and look for our next moneymaking opportunities. Tuesday offers bettors a full slate of games, and there are some interesting matchups on the card. Toronto - who fell to third in the AL East just two days after taking over first place - takes on the Houston Astros at Minute Maid Park, while first-place Baltimore plays host to the American League favorite Texas Rangers. Boston, who is fresh off back-to-back ninth inning victories, takes on Seattle. The Red Sox are just a game back of Baltimore for first. However, I am going to look past the AL East teams and play on two teams who are desperately chasing a wild-card spot in both the American and National Leagues. These props are based on the First 5 Inning lines, and I have the utmost confidence in what I expect to happen. As always, odds and lines are courtesy of 5dimes. The Detroit Tigers are playing some great baseball right now. They have won six in a row. If that's not enough reason to be happy, they are on the verge of finally being completely healthy. The team has been without slugger J.D Martinez and starting pitchers Jordan Zimmerman and Daniel Norris. All three are expect back this week. Because of that, the Tigers were very quiet yesterday on deadline day, citing that the biggest boost they could ever receive is players coming off the disabled list. As mentioned, the Tigers have won six straight and are only four games back of Cleveland for first in the Central and only a game and a half out of a wild-card spot. They are currently producing runs at a high clip, averaging 7.5 runs per game during their winning streak. Every bat in their lineup right now is hitting the ball well, and they should have enough firepower once again tonight to get past James Shields, who has pitched better as of late. The Tigers send Anibal Sanchez to the hill tonight, and he will be looking to perform better than his last outing against the White Sox. Sanchez was tagged for 10 hits and 4 runs in a no decision. He caught the Sox at a time when they were playing well, which is definitely not the case of late. He should be able to navigate the White Sox lineup this time around. Pitching for the White Sox is James Shields. Shields is 5-12 with a 4.68 ERA on the season and more specifically 3-5, 5.17 ERA for the White Sox. He was already the losing pitcher on record for their rain-shortened 2-1 affair, in which he gave up a pair of solo home runs to Ian Kinsler and Miguel Cabrera. The White Sox as a team have been miserable as of late, losing four of their last five games while scoring exactly one run in three of them. The better team is Detroit. And sometimes it's better not to overthink it. No matter the team, or the record, or the situation, it's always a tough pill to swallow when your team trades it's most valuable and highly-beloved player. The Reds did just that yesterday, trading Jay Bruce to the Mets in return for prospects that will help the rebuilding process. I expect that trade to have a lingering effect on the rest of the lineup and expect them to slump because of it. The Reds are back home after taking two of three versus the Padres in San Diego, and I think the cross-country travel will aide my fade of them. They send right-hander Dan Straily to the bump, and he is pitching well as of late. Opponents are hitting just .207 against the righty, who will make his first career start against the Cardinals. He leads the Reds' staff in innings pitched (122), strikeouts (97) and quality starts (12). While he has pitched well lately, I believe these are the kinds of games the Cardinals need to win in order to get back in the post-season hunt. The Cardinals have won 18 of the last 22 games at Great American Ball Park, and I have no reason to believe that number shouldn't be 19 after tonight. 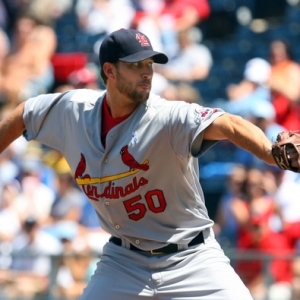 They send Adam Wainwright to the mound, and he has overcome a shaky start to post a 1.77 ERA in the month of July. The Cardinals have won 14 of his last 17 starts and have won six out of his last seven road starts. Before getting blanked 11-0 against Miami on July 30, the offense was able to put up at least four runs in four of their last five games. If you are a serious bettor and know the ins and outs of each ballpark, you will know that in the right conditions, Great American Ball Park is a hitter's paradise. The ball will carry, and teams will put up some crooked numbers. Fortunately for me, I'm backing the better pitcher, who should be facing a depleted lineup.